Cross Stitch is Good for your Health! 10 Jul Cross Stitch is Good for your Health! 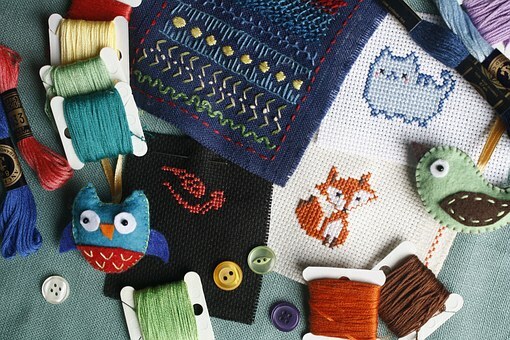 Here are some fabulous reasons why you should immediately start that new cross stitch pattern! Cross stitch is good for your health! Enjoy the read! “A question was posted on Facebook about why people cross stitch and what mental health benefit it had for them. The responses that many cross stitchers gave were very thoughtful. People were willing to share their stories on how cross stitched has benefited them. Not only their physical, but also their mental well being. Several of the same themes continued to pop up: Focus, Calm, Community and Stress Reducing. This is the viewpoint of the author, the people who responded to the questions and not meant as a substitute for the benefits of a psychologist. If you are having a difficult time, please reach out and get the help that you need. Cross Stitch is one way to heal and be healthy but there are many ways to reach out. Calm is a word that was used over and over. People explained that stitching was like meditation. The simple task of pulling the floss through the fabric, doing that same type of stitch over and over gave them a sense of well being, The repetitive motion was almost like a chant or prayer. When people began to feel overwhelmed by life tasks, stitching allowed them to sit down, breathe and regain the calm in their life. If housework was too overwhelming adding to their depression or anxiety, the simple task of stitching, regardless of the finished product, allowed them to regain their calm. Many first responders at crisis lines used stitching as a way to stay in the moment but not allow them to feed into the crisis at hand. It kept them level headed. It also allowed them to decompress after a difficult call. Others mentioned that they have suffered major bouts of depression and anxiety and said that cross stitching and various needlework projects help them stay focused. It allows their brain to concentrate at the task at hand, stitching, and not on the worry. Cross stitch allows the brain to focus and gives the body something to do, working together both mentally and psychically. Community is something we all need and from what has been gathered, it is important to many of us in the cross stitch world. The internet has helped with that greatly.There are cross stitch groups everywhere-Facebook, Twitter, and Flickr to name a few. These online groups are especially important to those who are homebound due to various issues. It is an amazing feeling of oneness for someone to tell you, “Hey, I get it, I love doing that too.” It makes us realize how connected we really are. Last is Stress Reduction. It’s a busy go go world…family, work, (or lack of work), school, it can be overwhelming, putting ridiculous demands on our lives and well being. Cross stitch allows us to sit back and just breathe. We can stitch alone or with a small group and feel the stress disappear (unless you are working with metallic thread…One person mentioned that, “when I cross stitch, I don’t have to please anyone but myself…” What a great way to equate cross stitch to stress relief. Every day, the demands of life stress you out, yet taking even a few minutes to cross stitch, brings you back to center. Even if you are creating something for another person, each stitch is about bringing yourself back. “For a lot of people, cross-stitching is a hobby that they learned from their parents or grandparents, and most people do not realize the skill that it takes to properly cross-stitch no matter the detail of the cross skitch. Regardless of the reason why someone starts cross-stitching or when, they might not realize that it is actually good for their health, particularly with good cross stitch kits. One might ask how doing hours of cross-stitching could actually be healthy, and below they will be able to find three different benefits that cross-stitching provides. According to cross-stitch enthusiasts, they have stated when being interviewed that cross-stitching is a calming practice for them. They have even gone so far as to state that it is a lot like meditation for them. The repetitive motion of pulling the thread through fabric allows the one cross-stitching to feel a sense of peace calming and slowing down their breathing allowing their entire body to fully relax. For people who have problems focusing on specific tasks, cross-stitching can be extremely helpful. When watching someone do a cross-stitch, it can be misconstrued as easy, but it takes a lot of focus and concentration to keep from missing a stitch while doing the repetitive motion. Therefore when cross-stitching, it has been proven that one is able to increase the sharpness of their mind due to the amount of focus that one has to utilize not to miss a stitch while doing the same repetitive motions for extended periods of time. Cross-stitching has proven that it is a great way to help increase one’s focus and mental abilities. As one gets older, it can a lot harder to keep one’s hands flexible. However, by cross-stitching, one can actually improve the flexibility of their hands, because the small motions one has to use while cross-stitching allows one to keep their hands from stiffening. Although it is not a cure, cross-stitching can actually assist in combating health issues like arthritis and what not. A lot of people who have been diagnosed with arthritis have claimed at the motions of cross-stitching have actually helped them better with their aches and pains. Sometimes, they say that this helps even more than their prescribed medications.